The Man o’ War Project presented the Dwight D. Eisenhower Memorial Perpetual Trophy for the $50,000 International Speed Class during the Washington International Horse Show’s Military Night on Oct. 27. The Man o’ War Project is supporting the first clinical research study in partnership with Columbia University to determine equine-assisted therapy’s effectiveness for post-traumatic stress disorder and to establish guidelines for using equine-assisted therapy to treat veterans with post-traumatic stress. In the course of equine-assisted therapy, a horse specialist and a mental health professional assist veterans in drawing connections between what the horses might be doing, thinking, or feeling, and their own symptoms. As they increase emotional awareness and the ability to regulate their emotions, they relearn how to build trust and how to trust themselves, keys to success in family, work, and interpersonal relationships. The All Glory Project was the beneficiary charity at the recent International Friesian Show Horse Association’s World & Grand National Championship Horse Show in Springfield, Ohio, which also hosted a Military Night. The All Glory Project promotes, fosters, and supports programs and institutions that use animal-assisted and adjunct therapies to aid the military, its veterans, and their families. Named for a Standardbred competed by Elizabeth and William Shatner, the All Glory Project has collaborated with groups across the nation to bring therapy to veterans. Horses, mules, and donkeys have also been military veterans, and these equine veterans’ plight after World War I ended prompted Dorothy Brooke to establish the Brooke Hospital for Animals to help care for them. Today, Brooke is a global charity that helps working equines around the world through free veterinary clinics, practical education for owners and local service providers, research, and more in areas where the horses work. 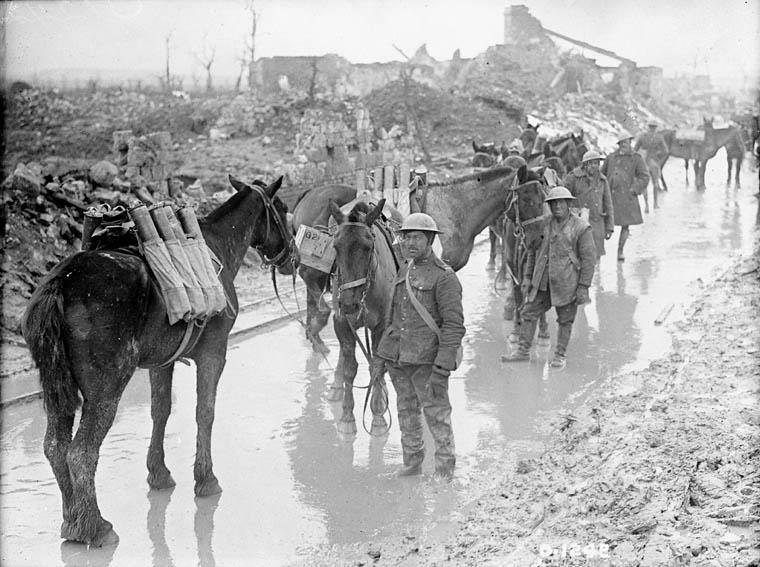 This year, as the U.S. commemorates the centennial of our entry into World War I—during which the U.S. sent about 1 million horses and mules to Europe to support the allied effort—Brooke USA has launched the Horse Heroes campaign, calling on horse-lovers to honor those American war horses by helping today’s working equines. To learn more about the Horse Heroes campaign and the role of American equines during World War I, visit the Horse Heroes page at Brooke USA. The Man o’ War Project, the All Glory Project, and Brooke USA are all 501(c)(3) non-profit organizations. This article is original content produced by US Equestrian and may only be shared via social media. It is not to be repurposed or used on any other website than USequestrian.org. This entry was posted in Education, News and Announcements on November 10, 2017 by ludlumfarms.